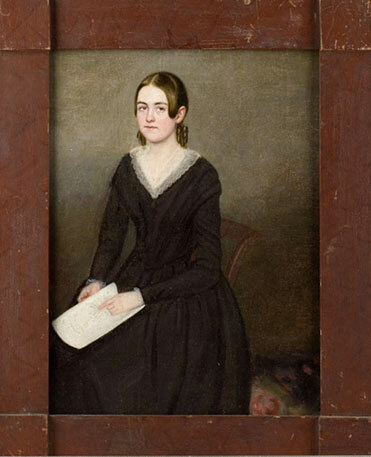 Set against an olive green background, the young woman in this three quarter length portrait is seated in a Windsor chair and wears a black dress with a white lace collar. She holds a book in her hand. The painting has been relined and is on a new stretcher and housed in its' period corner block frame. It is in excellent condition. ( 20 x 16 inches framed and 15-1/2 x 11-1/4 inches, sight).